← Getting Ready to Retreat…..
Merry Christmas, dear readers! And a Merry Christmas to my dear husband, Steve Smith!!! Guess what Santa brought him?!!! 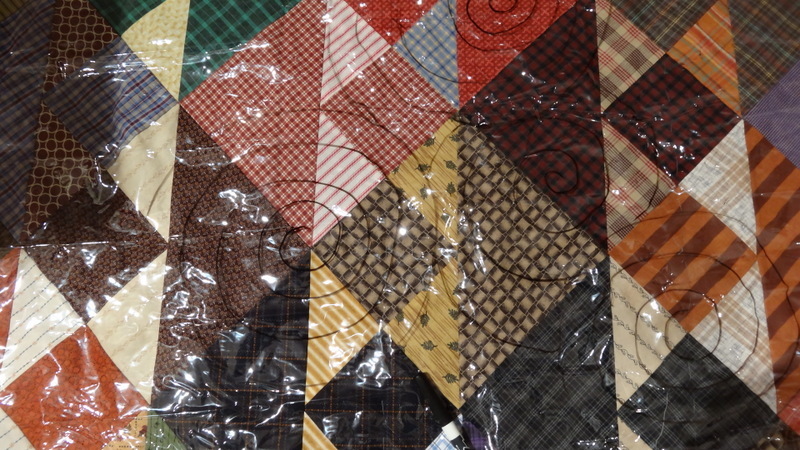 Of course, a new quilt!!!! And of course, it wasn’t done by the 25th. 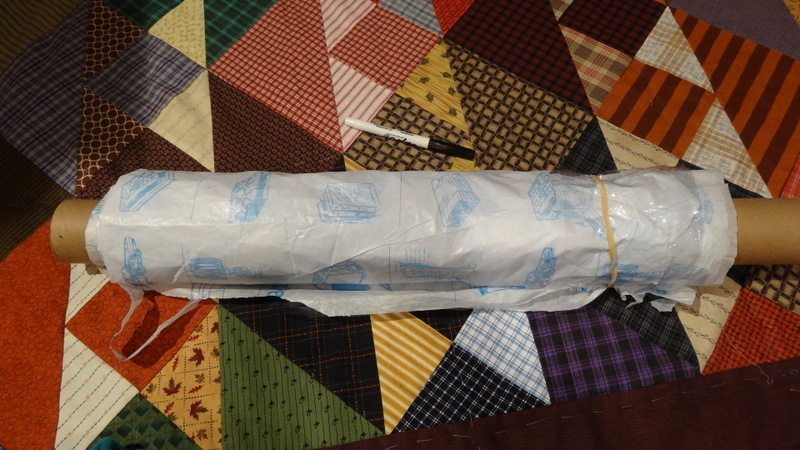 He got to unwrap the basted sandwich version of his quilt but he didn’t mind. 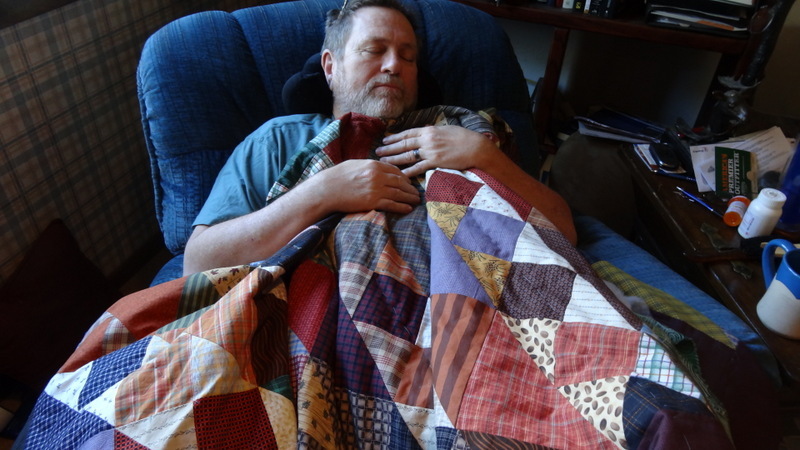 He was, and still is, thrilled to have his very own quilt….a first for him!!! 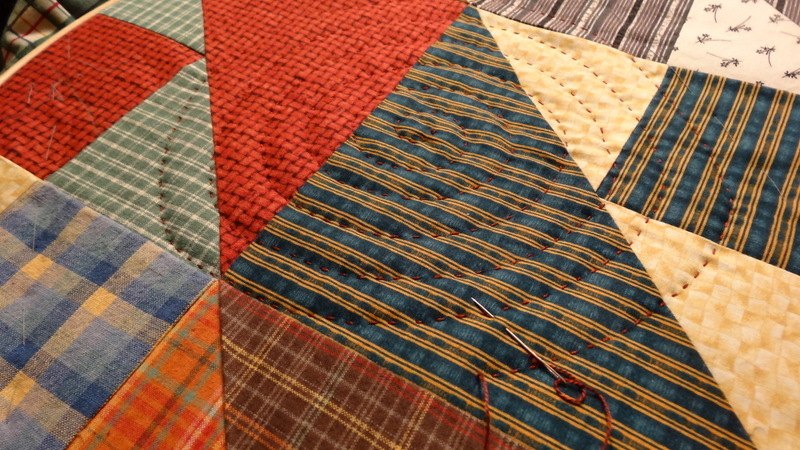 I started piecing the squares after finding a picture of a top that I thought he would love in Roberta Horton’s book, Plaids and Stripes: The Use of Directional Fabric in Quilts (1990: C&T Publishing). pg. 70. 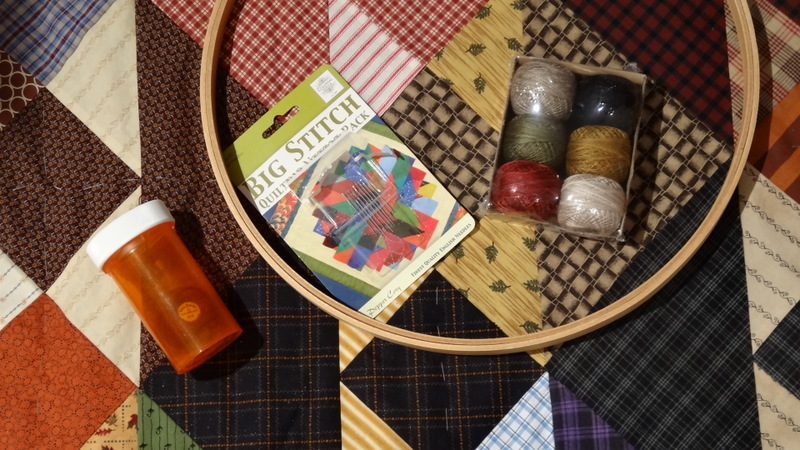 I drafted my “8 block on graph paper then started cutting out pieces from fat quarters and scrapes of plaids, stripes and mountain related prints which I have collected and kept in my stash over the years for just such a project. 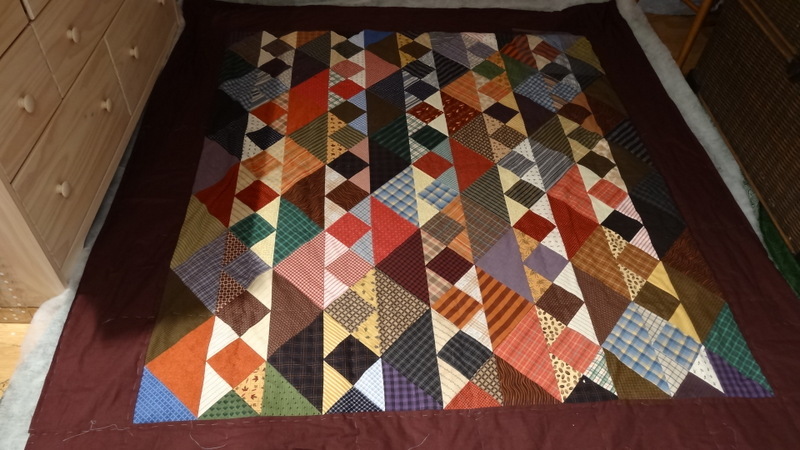 Math became an issue when I realized I had cut many of my large triangles too small and ended up squaring up my blocks to be 8″ unfinished – 7.5″ finished. (The book has template for a finished 6” block). Then I needed to figure out how many blocks I would need to make as well as how many half blocks to make, so I also drew up a blueprint of my top with borders. I was so glad that I had a weekend retreat to build the top in October. It really was a fabulous feeling to have a completed, pieced top done in such a short time and it was still a mystery to Steve!!!! I laid the clear plastic over my quilt top and tried out various ideas by drawing them with the dry erase pen. The marks come off clean when wiped with a tissue or clean rag. If left to dry on the plastic, water will remove them, also. 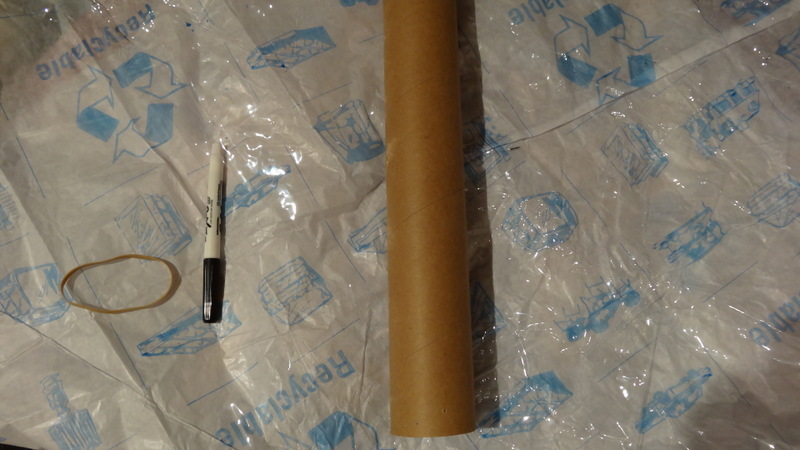 Once cleaned, I store the plastic for future use on the cardboard tube. 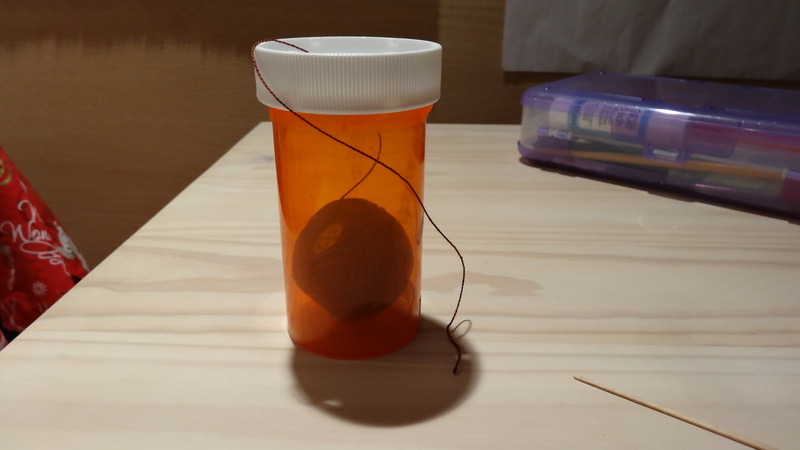 I use the pill bottles to carry around my thread. 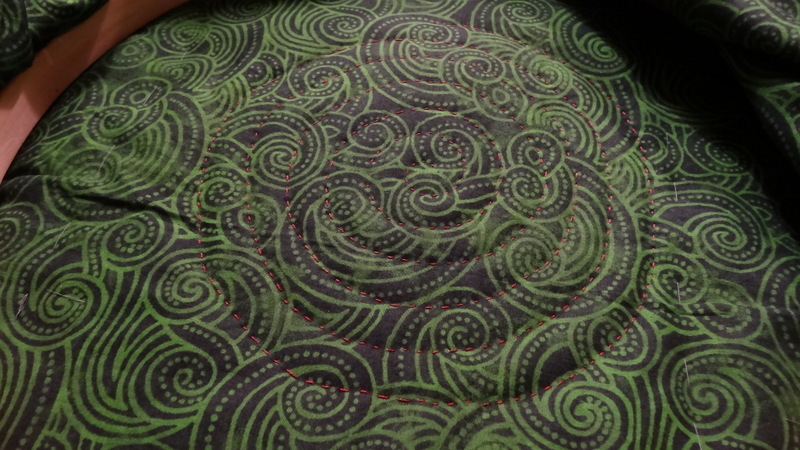 I poke a hole in the top to dispense my thread easily — never have to look for the end and it doesn’t roll away from me! I use a tooth pick to thread the perle cotton through the hole in the lid. I love the way it is project is quilting up!!! And it is so much fun to use a larger stitch and thread!!! Bring on winter!!! I will be quilting!!! Merry Christmas all!!! This entry was posted in Big Stitch, Quilt study, Quilts. Bookmark the permalink. Not only a beautiful quilt, but so full of love. 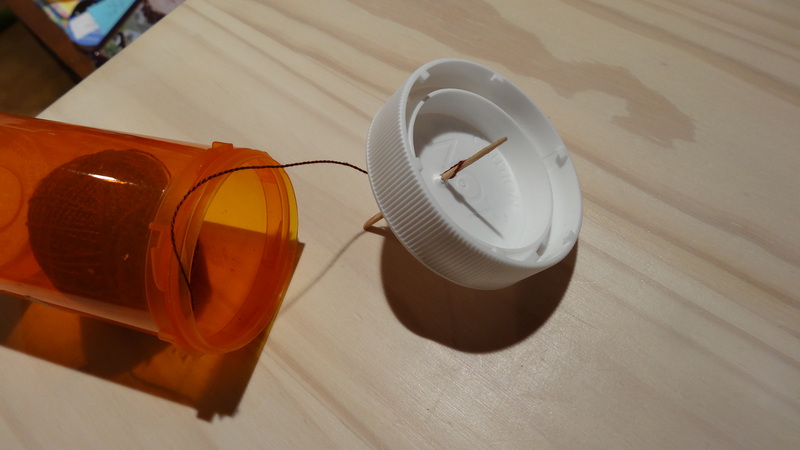 What a brilliant idea, or two of them – the plastic quilting “template” and the pill bottle for a thread-keeper. Happy New Year ! Happy Near Year to you, Melissa! May you finish many projects in 2015!! !